Note: Unless otherwise noted, details are as of April 4, 2019. Bills change as they go through hearings, click link on bill title to view the current text on the official state legislature website. AB 1484 (Grayson) Mitigation Fee Act: housing developments. Development fees published and constant throughout project approval process. Makes it easier to build housing by reducing uncertainty. 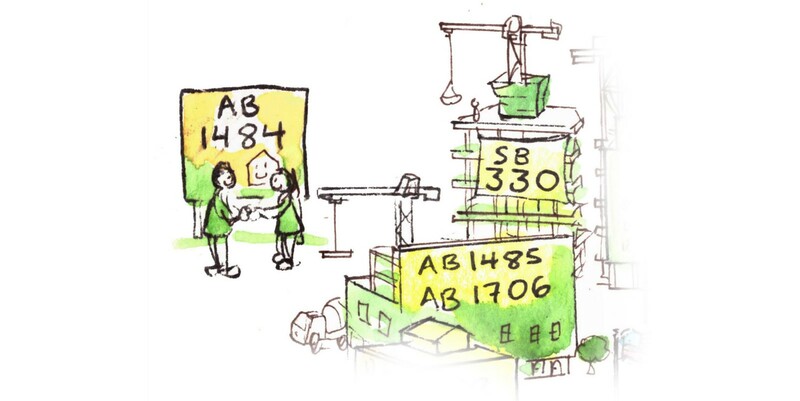 AB 1485 (Wicks) & AB 1706 (Quirk) Housing development: incentives. Incentives and faster approvals for moderate-income housing built with prevailing (union) wage labor. Applies in the 9-county Bay Area. Faster approvals for housing & zoning changes; no parking requirements; statewide ban on downzoning. Also bans housing moratoriums or population caps, as well as fees on low-income housing. SB 50 (Wiener) Planning and zoning: housing development: incentives. Upzoning near jobs, good schools, and mass transit. To avoid displacement, properties that currently or recently have tenants are not upzoned. Low income sensitive communities near transit are given time to propose their own community plan and zoning through a community process. 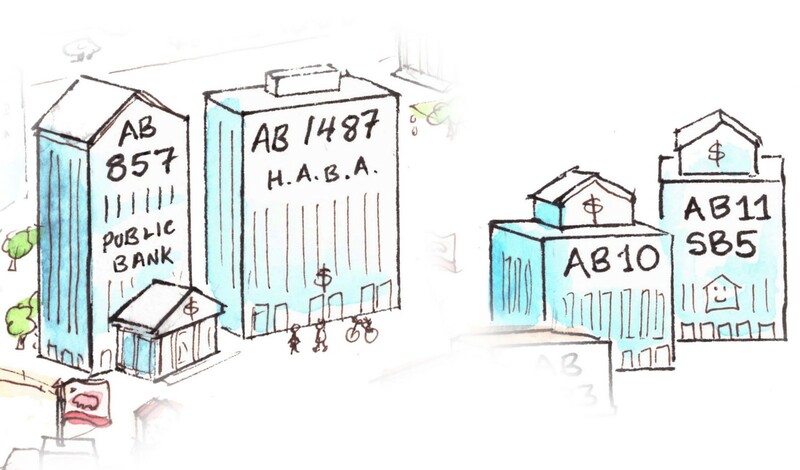 AB 1763 (Chiu) Planning and zoning: density bonuses: affordable housing. 80% density bonus for affordable housing. Current law only provides a 35% bonus. SB 48 (Wiener) Interim housing intervention developments. By-right approval for homeless shelters. This means that if a homeless shelter is proposed to be built and it meets existing zoning codes, the city has to allow it. AB 723 (Wicks and Bonta) Low-income housing incentives: leased rental housing: Counties of Alameda and Contra Costa. Property tax exemption for housing leased for 35+ years to nonprofits in Alameda or Contra Costa County. Rent in such buildings would be limited to 30% of a low-income tenant’s income. SCA 3 (Hill) Property taxation: change in ownership: inheritance exclusion. Ends inheritance of Prop 13 tax break, unless heir lives in the house. Currently, the assessed value that is used to set property taxes is based on the original purchase price plus a 2% increase per year, even if the market value of a building has gone up faster. As a state constitutional amendment, this would go to the ballot for voter approval. AB36 (Bloom) Residential tenancies: rent control. Costa-Hawkins reform. AB-36 would allow cities to extend rent control to houses, condos, as well as new buildings after 10 years from date of completion. Exemption for landlords that own two or fewer homes in a city. SB 529 (Durazo) Tenant associations: eviction for cause: withholding payment of rent. Protections for tenant organizing. Prohibits landlords from evicting tenants in retaliation for organizing. Allows tenants to hold 30-day rent strikes to protest lack of maintenance, etc. AB 1481 (Bonta) Tenancy termination: just cause. Statewide Just Cause limits to evictions. Limits evictions to “Just Causes” such as not paying rent, using the unit for criminal activity, repeated nuisances, major renovation, or demolition. Owner move-in evictions only allowed if tenant agrees to allow them in initial lease, completely banned if if the tenant is 60 years of age or older, disabled, or catastrophically ill.
AB 1482 (Chiu) Tenancy: rent caps. Rent cap: Statewide limit to annual rent increases. Also known as anti-gouging, this cap would apply statewide to all homes not already covered by a stronger local rent control ordinance. Percentage TBD, proposals are inflation plus a few percent. AB 1110 (Friedman) Rent increases: noticing. Longer notice required for rent increases: 60 days for under 10%, 90 days for 10–15%, 120 days for 15%+. Currently, only 30 days is required for increases up to 10%, and 60 days above that. AB 437 (Wood) Move-In Loan Program. Move-In Loans for security deposit and first month’s rent. SB 329 (Mitchell) Discrimination: housing: source of income. Requires landlords to accept Section 8 vouchers. Ban the Box: no questions on criminal record on initial rental applications. Background check can only be conducted after initial application has been accepted. SB 18 (Skinner) Keep Californians Housed Act. Funds for legal aid and rent assistance. The goal is to prevent tenants from falling into homelessness. AB 857 (Chiu and Santiago) Public banks. Allows cities to create Public Banks. These banks would provide loans for affordable housing and other public infrastructure. AB 1487 (Chiu) San Francisco Bay area: housing development: financing. Creates Housing Alliance for the Bay Area (HABA), a regional entity to raise $1.5 billion via ballot measure for affordable housing. AB-10 Income taxes (Chiu, Bonta, Maienschein, Reyes, and Wicks): credits low-income housing: farmworker housing. Expands Low Income Housing Tax Credit funding program by $500 million per year. The LIHTC program is one of the main sources of funding for affordable housing. Cities often use tax credits as “matching funds” to multiply local funding to get several times more homes built. SB-5 (Beall, McGuire) Affordable Housing and Community Development Investment Program. Creates new local funding agencies for affordable housing, infrastructure, and community investment. Prior to 2011, redevelopment agencies were a major source of affordable housing funding. Governor Brown eliminated them in 2011 due to a budget deficit. AB-11 and SB-5 would create similar organizations with a greater focus on housing and infrastructure. 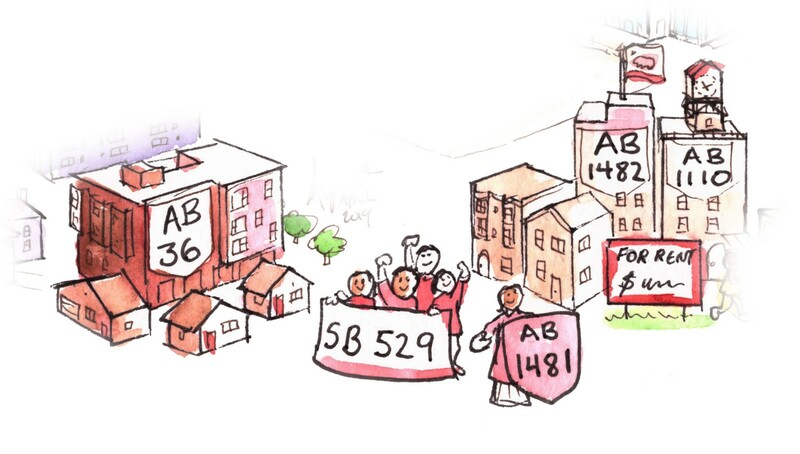 AB-1486 (Ting) Local agencies: surplus land. Surplus public land for affordable housing. AB 724 (Wicks) Rental property data registry. Creates rental housing database with information on unit sizes, rents, evictions, ownership, vacancies, etc. 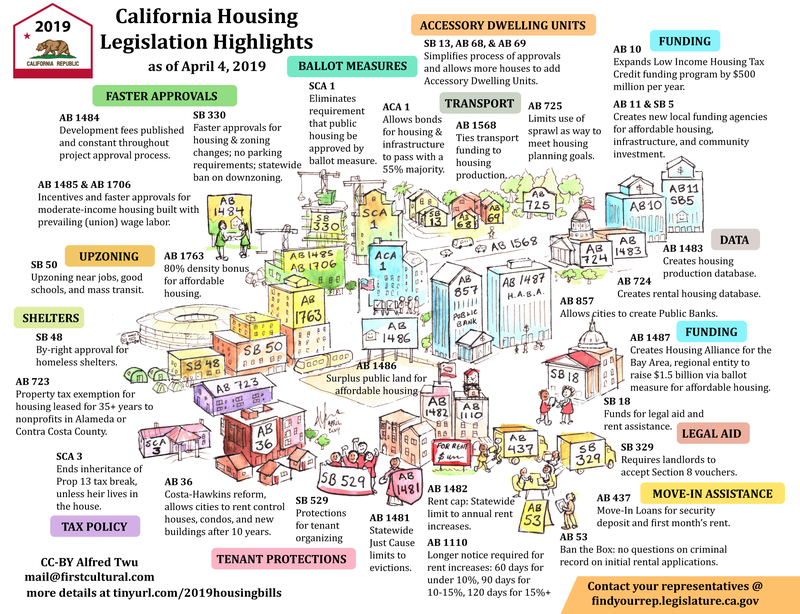 AB 1483 (Grayson) Housing data: collection and reporting. Creates housing production database, with GIS system featuring all land in the state, and tracking of how cities and counties are doing towards their housing production goals. 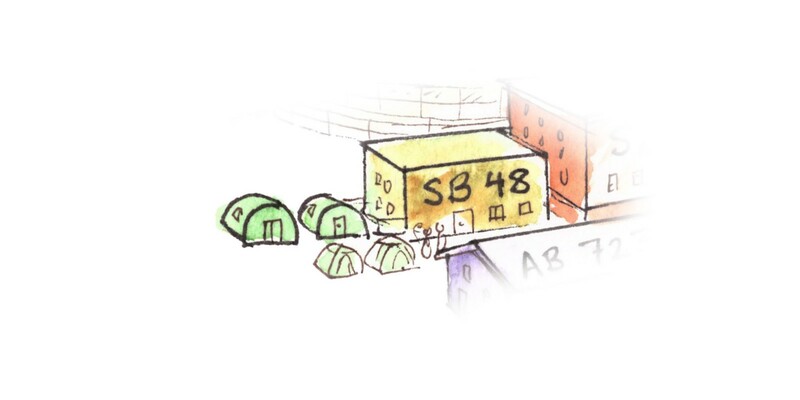 AB 725 (Wicks) General plans: housing element: above moderate-income housing: suburban and metropolitan jurisdictions. Limits use of sprawl as way to meet housing planning goals. In suburban and metropolitan areas, only 20% of market rate housing development would be allowed to be planned as single family housing zones. Ties transport funding to housing production. Cities or counties that don’t plan for their share of housing production would lose state transportation funding. SB 13 (Wieckowski) Accessory dwelling units. Limits fees and restrictions on building new accessory dwelling units. For example, ADUs created by converting a garage would not be required to have replacement parking. 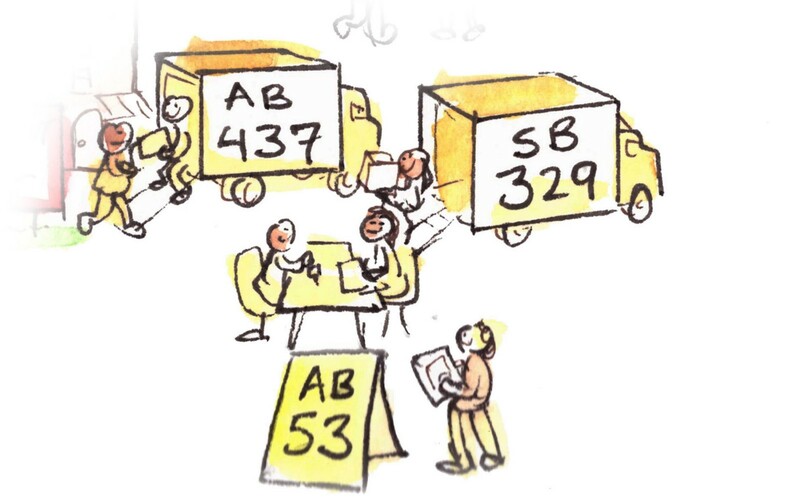 AB 68 (Ting) Land use: accessory dwelling units. Eliminates minimum lot size requirements for adding an ADU. Also requires proposed ADUs to be approved or denied within 60 days. AB 69 (Ting) Land use: accessory dwelling units. Would create new building code standards for small homes under 800 square feet, allowing greater cost efficiencies. SCA 1(Allen and Wiener) Public housing projects. Eliminates requirement that public housing be approved by ballot measure. Currently cities have to pass ballot measures every few years to authorize new quantities of affordable housing. Also known as Article 34 repeal. As a state constitutional amendment, this would go to the ballot for voter approval. 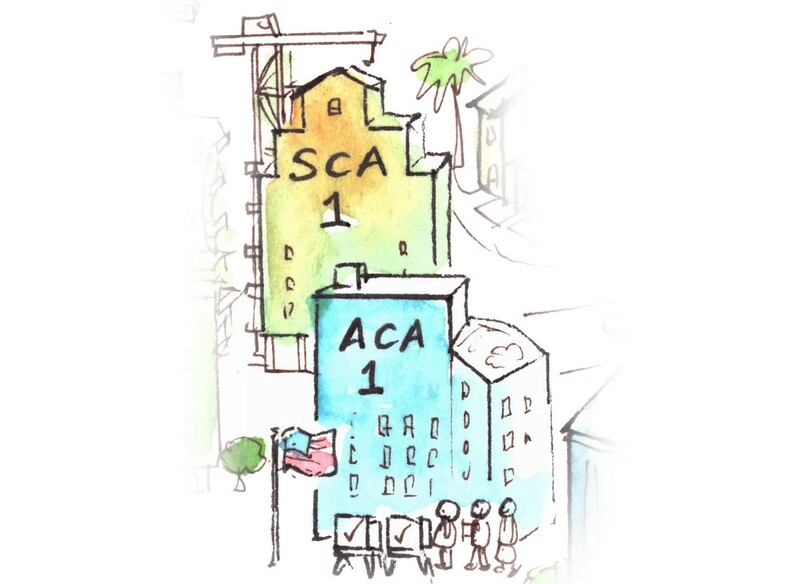 ACA 1 (Aguiar-Curry) Local government financing: affordable housing and public infrastructure: voter approval. Allows bonds for housing & infrastructure to pass with a 55% majority. Currently the threshold is a 2/3 majority. As a state constitutional amendment, this would go to the ballot for voter approval.